M&T131G-PICTURESQUE VIEWS OF COLORADO'S FINEST MOUNTAINS!! M&T131G - This beautiful home boasts tremendous mountain views and sits on one of the nicest lots in Woods at Buck Mountain.This newly renovated home has attention to every detail and has nearly 4,634 square feet, which includes 3 bedrooms, 2 offices, large family room, theater room and large attached heated workshop plus attached 3-car garage! The main level has a large great room, custom kitchen with new appliances including double oven/cooktop, formal dining room, master bedroom/bath, powder room, large office, breakfast nook, laundry and kitchen pantry. The lower level is a walk-out basement with a theater room, 2 bedrooms, workout room, 3/4 bath, storage/mechanical room and an office or 4th bedroom. The home is nicely landscaped and has a fenced-in back yard. The 37+ acres has nice meadows for animals, towering pine forests and gently rolling hillsides. It is a great property for hiking and exploring with ample room for additional outbuildings or barns. 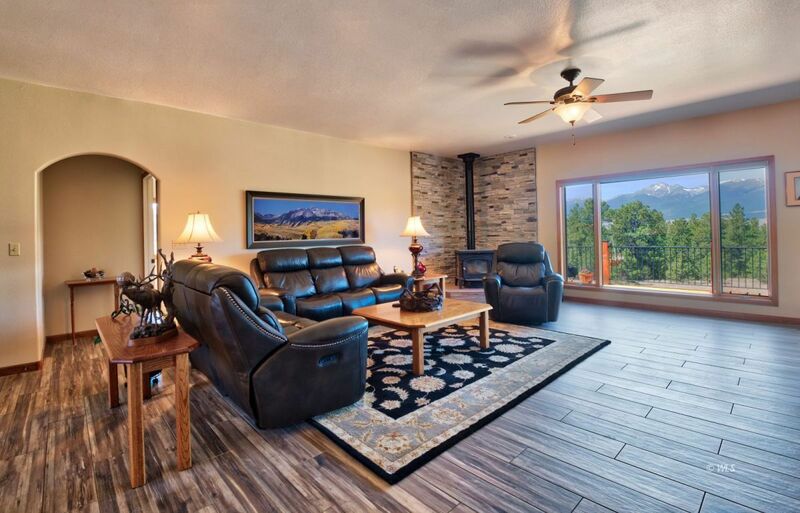 This fantastic home is heated with in-floor radiant heat, and wood-burning stove in the great room area. PRICE REDUCED to $749,900!